The AMA Pro Athlete of the Year presentation in 1981. 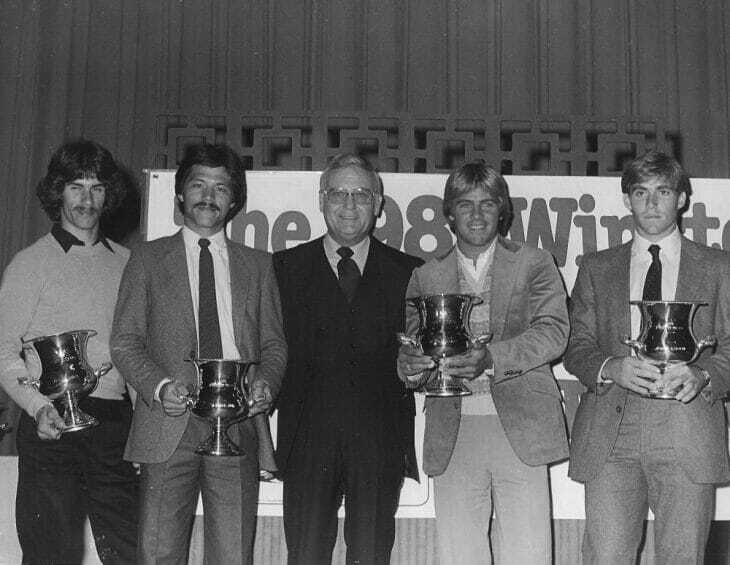 In this week’s Throwback we wind back the clock 36 years to1981 and the annual AMA Pro Awards banquet. That year the AMA awarded the prestigious AMA Pro Athlete of the Year to multiple riders. That year Americans had such an embarrassment of riches in the racing world the AMA did not feel right in giving the award to a single rider, instead the 1981 U.S. Motocross des Nations (and Trophee des Nations) team of Donnie Hansen, Danny LaPorte, Johnny O’Mara and Chuck Sun, along with 1981 World Speedway Champion Bruce Penhall, were all awarded the prize. It marked the first time that multiple riders took home the AMA Pro Athlete of the Year Award. In the photo accepting the award that night was (from left to right) Donnie Hansen, Chuck Sun, presenter AMA President Lin Kuchler, Bruce Penhall and Danny LaPorte. The early 1980s was a golden era in American motorcycle racing when riders from this country began winning world titles and nearly all genres of the sport.